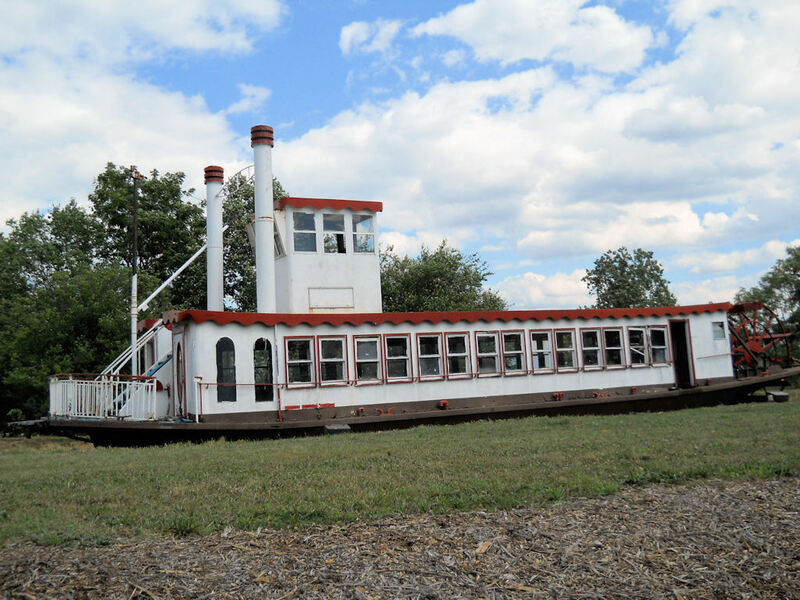 Just down the street from Roadside America Miniature Village you’ll find a real riverboat plunked down in the middle of a Pennsylvania field with no water in sight. John and I first stopped at the saloon back in autumn of 2006. 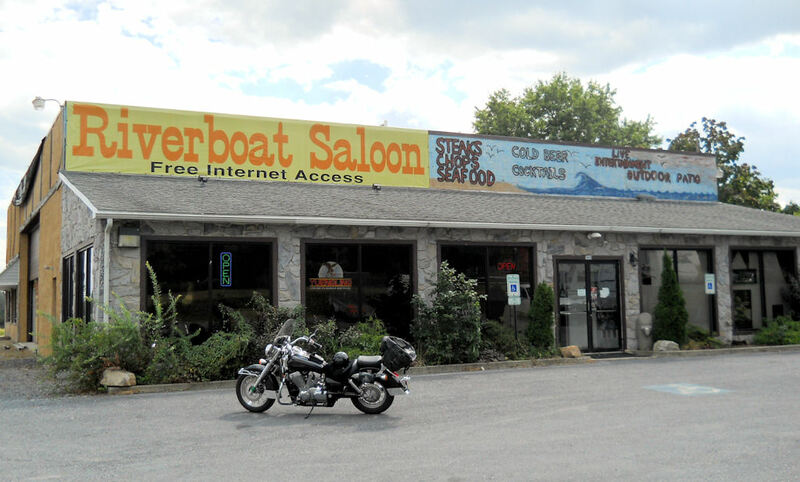 You just know I had to pull my bike over when I saw that boat 🙂 It was late afternoon — and though there weren’t any cars in the parking lot, the neon lights in the bar’s front windows were on. 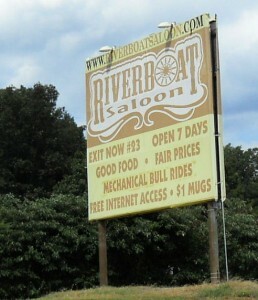 Being curious about the riverboat, we walked into the bar hoping to hear a good story and grab some dinner. It was the weirdest thing …. the interior lights and the jukebox were on but there wasn’t a soul in the building. We wandered around the bar and the adjacent dining room/stage area for a few minutes. The building even “felt” empty if you know what I mean. John called out a few times thinking that maybe someone was in the kitchen or in a back room … and nothing. Weird. Last summer, I was in the area once again so I decided to stop in to take some photos and see if I might be able to ask someone about the boat. Oddly enough, the exact scenario repeated itself! Lights on (though not the jukebox this time) but no one seemed to be “home”. I walked around briefly; but I quickly got the creeps — maybe even faster this time since I was alone. I have called the phone number on the saloon’s website (which was updated as late as September of last year) on several occasions and I’ve yet to have anyone pick up the phone. The site does mention that riverboat was already on the property when the saloon opened … now I’m even more curious! Have you visited the Riverboat Saloon? I had no idea that it was “open”. I rode by 2 years ago and thoughts it was completely abandoned and derelict. Your story sounds like a great start for a horror movie. Maybe the riverboat is a gateway to another dimension. Once again you find something awesome I’ve manged to miss in an area I sometimes ride in. Must be a special superhero skill; I certainly don’t ride with eyes closed. :^) I’ll be sure to check out the riverboat next time I’m up near Shartlesville. I’m definitely going to try to hit one of the Sunday Bikers’ Breakfasts at Haag’s this year. Just drove by this Friday evening 3/30/18. Stopped to take a look. The riverboat is cool, but the whole place is creepy. Bar was not open, abandoned cars in the parking lot with flat tires, dog barking at us from it’s run next door. There were beer bottles littering the ground around it. 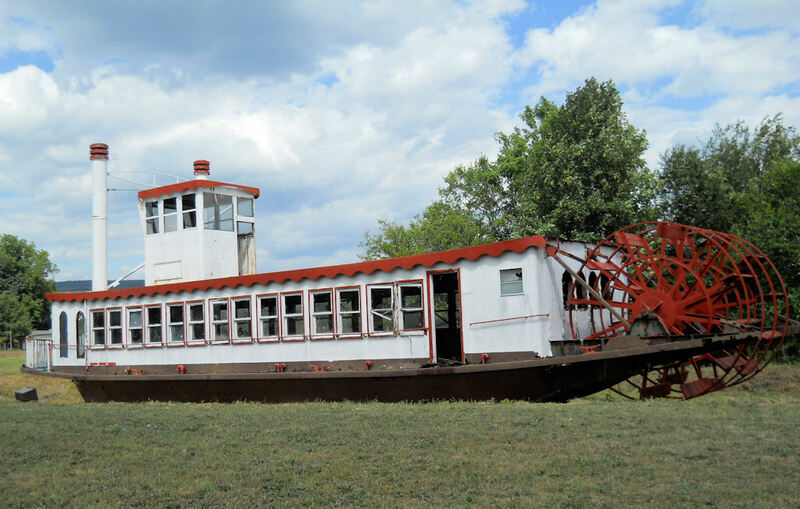 The riverboat is in really rough shape. Cool find, though. Happy I found it. I haven’t stopped in a few years; but it’s weird, right?